Explore our Boise new subdivisions guide or browse all Boise townhomes for sale. Close by you will find, the Idaho Shakespeare Festival, Warm Springs Golf Course, Bown Crossing, and the Idaho Botanical Gardens. 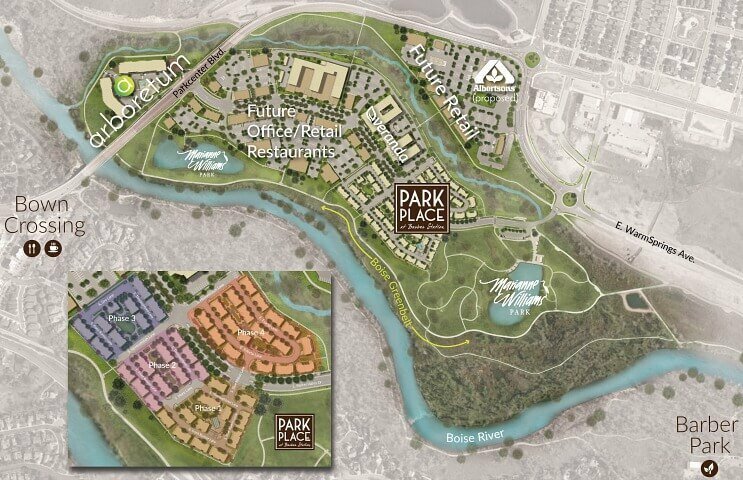 Additionally, Park Place townhomes offer direct access to the Greenbelt, trails in the Boise Foothills, and Boise River where you can fish, raft or kayak! From downtown head East on Parkcenter Blvd, across the E Parkcenter Bridge. Turn right (SE) onto E Barber Valley Dr and continue to S Homestretch Ln, Boise, ID 83716. Park Place at Barber Station offers Boise low maintenance urban living at its best. For questions or a personal tour, contact us online or call (208) 391-4466.